Suffering is one thing, but don't suffer where you sit. Extra on-bike comfort translates to extra speed. 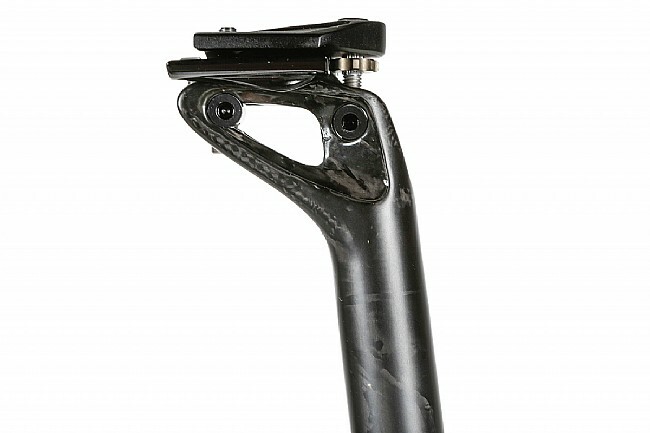 The 25 mm setback head on the Cyrano 00 Seatpost is designed to flex to smooth out the roads while seated. The post is built from high-modulus uni-directional carbon/aluminum ergal. 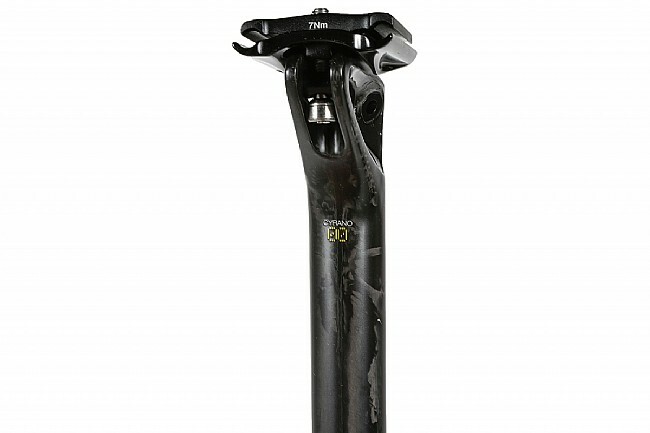 The hardware is titanium to save weight, bringing the post's weight down to 190 grams. Available in 27.2 mm or 31.6 mm sizes. T25 torx bolts. 27.2 mm diameter. 330 mm length. 190 g.
I have always favored Cyrano seat posts from Fizik for their adjustment mechanism - it's simply brilliant. A thumbwheel to adjust the tilt and then you tighten down the rear bolt to snug it up. It is far easier to adjust tilt on this post than on almost any other post I have used. 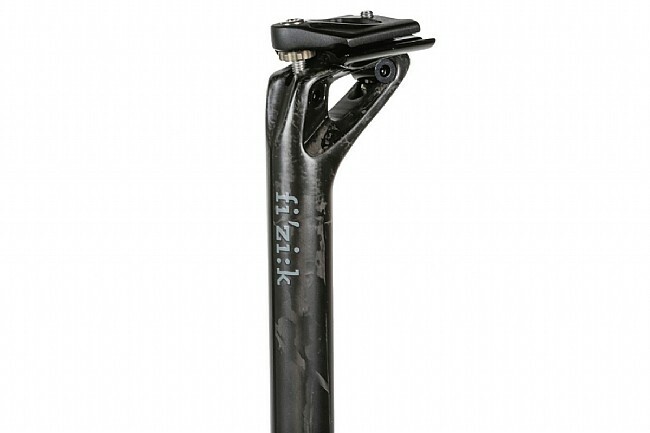 That said, prior Fizik carbon and especially their aluminum posts are rigid and lack almost any vertical compliance making them uncomfortable if you have a frame that doesn't not have a lot of vertical compliance. However, this seat post is amazing. Prior to this, I had been using a Ritchey Flexlogic seat post which was designed with considerable vertical compliance and which effectively took out a lot of harshness of a ride on a rough road. However, that post got it's compliance from, essentially, fore and aft movement which turned the post into an egg shape as it moved and caused it to slip. Very difficult to hold vertical position with that post. Long story short, it was time for a change. When I saw this post, with the unique cantilevered carbon arm, I gave it a try. This post has just as much, if not more, compliance than the Ritchey (which was very good) and it has that wonderful Cyrano Fizik adjuster! I bought it, put it on and am very pleased. This post gets it's compliance from the flexing of the cantilevered arm (up and down and not fore and aft). Does a great job at taking out the harshness of the ride and is easy to adjust. This just became my new favorite seatpost.